This week has been one of trying old things again for the first time since my adventure in Vancouver. I glazed a set of 16 plates and 17 of the spice jars in my water glaze. I had to take care to keep my belly happy and it was a good reminder of safe body positioning. 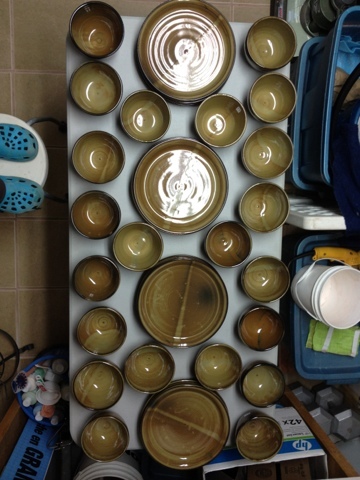 It showed me that I tend to curl my shoulders and bend my head forward while I am mixing the glaze tubs. The next day, I loaded the big kiln with all 16 plates and some jars in one load which is the most plates I have ever fired at once and was very pleased to open the kiln the next evening to see that they had all turned out well. I called the customers and they popped by the next day to pick out their set. I always make extras and it was a great idea here too. They took home the plate set and a set of bowls along with just the right mug for two tea bag sized serving. I hope every January is filled with throwing orders and february/march is filled with sending them home.